This exciting train-building kids' app is filled with delightful mini-games that teach early learning skills. Wee Trains is a kids' app that puts toddlers and preschoolers in charge of designing their own trains and then driving them. As players chug along the track, they encounter mini-games that teach early learning concepts and logic. From the opening screen, players have two options: play with the trains or paint an engine. In the latter, you can use a simple paint program to color engines. The bulk of this app's experience is found under the "play option." Kids "play" by building their own custom trains. Bins appear, clearly marked with different kinds of engines and train cars. First, kids select an engine and then move on to add three other carriages. The type of carriage you select controls the kind of mini-game you will play once you mosey down the track. 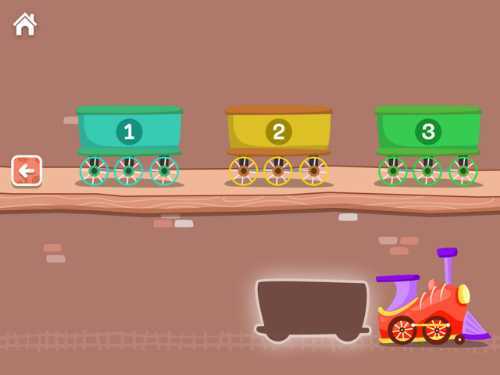 If the player chooses a train car from the numbers bin, the mini-game will be about collecting objects to match the number on the carriage. Putting a passenger car in your train means you will stop at a platform to find a specific passenger within the crowd. Likewise, adding an animal car leads to a game about finding an animal that matches the color of the bars on the carriage. By selecting a water carriage, children discover pipes that need connecting to make the water flow into the train car. 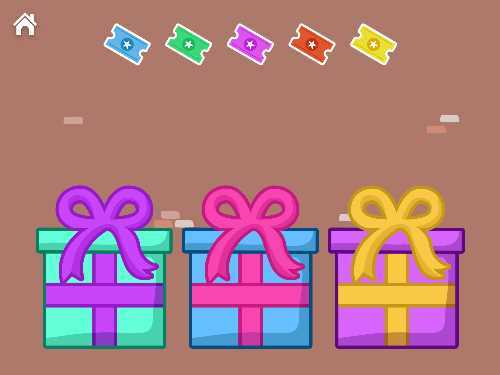 Also fun are music cars, where the minigame involves matching musical tones, and the shapes cars, where kids collect shapes to match the design shown on the car. Sometimes the mini-games involve clearing the track. As players roll down the track, they will also see tickets floating above the track. By tapping these, they collect them and thus unlock new engines, carriages, places to travel, and stickers to use in the paint activity. 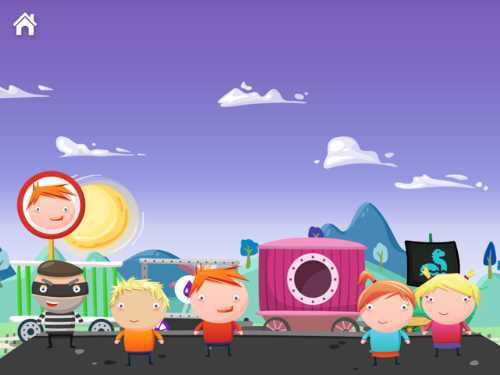 Wee Trains is a brilliantly designed train app for young children. Its interface is so intuitive that no words are needed (or spoken) in the app. It is easy to assemble a colorful train and start on a journey. Each time the train stops, a red sign hints at what the player needs to do; and when they accomplish the task, the sign turns green and the train continues to roll along. By having the decision-making in their own hands, preschoolers feel empowered as they build their colorful trains, using over 100 different train engines and cars. They solve problems as they travel the rails, while cheery music accompanies the chugging little train. This app motivates kids to keep playing and exploring by letting them collect floating tickets. The tickets are this app's currency; and are used to unlock new items slowly over time. It's exciting to explore the new unlocked locations, including underwater and outer space. The app also cleverly ties in the creativity-using painting activity, because kids can use the engines they painted to pull their trains. It is important for kids to see diverse representation of people in the media they consume. The passengers you pick up on the train platforms are mostly diverse, representing different races and gender. There is even one child in a wheelchair and a silly character in a mask who looks like a thief. Parents, there is an ad for another app from this developer on the home page, but you can disable it from within the Settings app of your device. Since your child doesn't need to see advertising, we recommend you take this action. 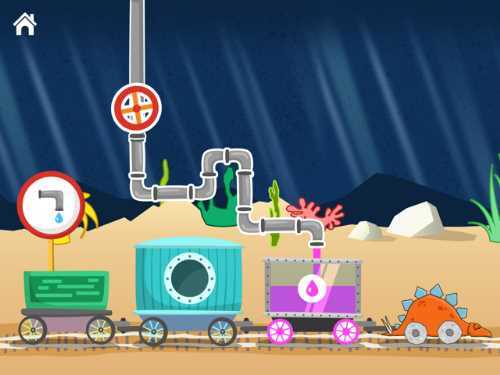 Wee Trains is a great app for all train-loving toddlers and preschoolers. It uses the train motif to introduce kids to early learning concepts. And it is full of whimsy -- you never know who might be blocking the track -- including a rocket just waiting to blast off. 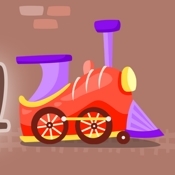 This kids' app review of Wee Trains was written by Jinny Gudmundsen and was originally published on April 28, 2016 and was updated on Feb. 2, 2017.